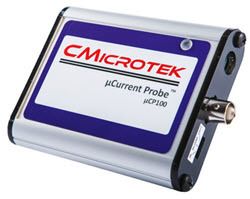 Summary: Another tool has arrived for measuring the current used by low-power microcontrollers. My cup runneth over. Vendors keep sending nifty tools for measuring the current consumed by low-power embedded systems. Recently the intriguingly-named 3flares (3flares.com) delivered their AMPERE analyzer. It's one of the few I've looked at where no claims are made about power measurements; instead they correctly state that the device tracks current. Housed in a beautiful small metal box the thing looks like it could be run over by a tank and survive. The AMPERE analyzerThe USB port on the side is used only to power the analyzer; there are no comms with a host computer. 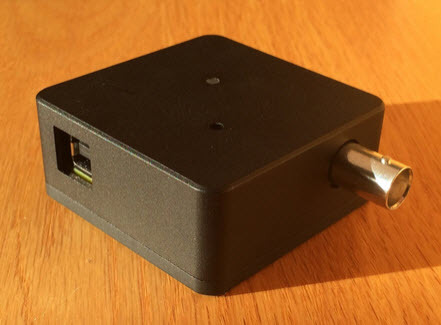 The BNC goes to your scope, and a connector (not shown) on the side opposite the USB is for two wires that go to your embedded system. They run across a 0.1 ohm sense resistor inside the box. Internally (I did take it apart) it's basically that sense resistor feeding a multi-stage amplifier with a gain of 298. 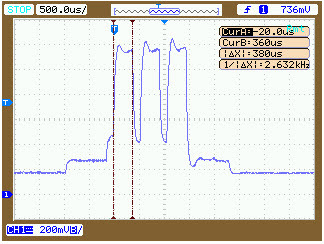 If your system draws one mA the scope shows a DC signal of 29.8 mV. As I have noted in my series (http://www.ganssle.com/reports/ultra-low-power-design.html) on designing ultra-low power systems, it's critical to understand your system's current profile. Those short Bluetooth squirts may very well cause the board's brown-out detection circuits to fire. Or, if battery powered, the cell's internal resistance may not be able to source the required current, so your system crashes. Other specs are interesting. It can take plus or minus 10V. Few other units handle positive and negative inputs. That feature could be important when, for example, working with charging circuits. The sense resistor is « watt. With a +/-400 mA range it will read down into the microamps. A resistor and an op amp? What's the big deal? The most important spec is the unit's 800 KHz bandwidth. That can be hard to achieve, especially with the stated 1% accuracy. Yes, you could build something like this. But you probably won't. It doesn't like long sense wires going to the target; I found a lot of 60 Hz pickup using multiple clip leads. That went away with short point-to-point wiring. The only thing I didn't like about the AMPERE is the price, at $475 CAD, or about $375 US. Low power has always been important in the embedded space. I remember watching a Motorola processor run from the power of a pair of lemons back in the late 70s. But there has been a sea-change in the industry recently. Today MCUs will run off the energy of a few free-floating electrons, practically. Microchip was one of the pioneers. Now ARM MCUs are everywhere; Digi-key lists over 6000 part numbers for Cortex-M parts. Many of these will run for years from a battery. The so-called IoT is demanding ever more systems that run from batteries or from energy harvested from the environment. If you're building low-power systems, do equip your lab with tools to measure current consumption. After all, engineering is about holding our aspirations and designs to the cold hard truth of real numbers.